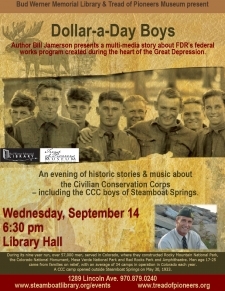 Bud Werner Memorial Library and Tread of Pioneers Museum present an evening of historic stories and music about the Civilian Conservation Corps � including the CCC boys of Steamboat Springs. 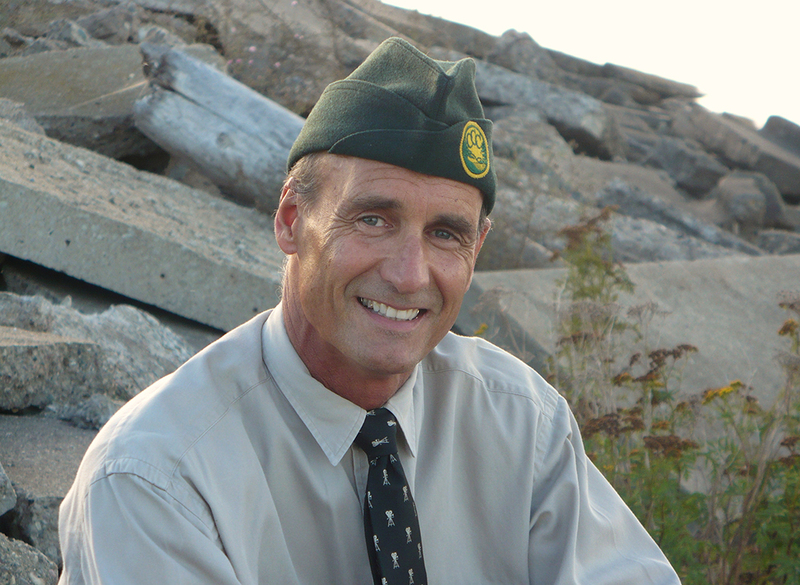 Michigan-based author Bill Jamerson presents a multi-media storytelling program about the Civilian Conservation Corps, President Franklin Delano Roosevelt's federal works program created during the heart of the Great Depression. During its nine-year run beginning in 1933, over 57,000 men, known as the "dollar-a-day boys," served in Colorado, where they constructed hundreds of miles of roads, built bridges, worked on soil erosion control, were active in reforestation, and worked on grazing control operations that restored grass and water to vast stretches of land for cattle and sheep grazing. They constructed Rocky Mountain National Park, the Colorado National Monument, Mesa Verde National Park and Red Rocks Park and Amphitheatre. The men were 17-25 years old and came from families on relief. 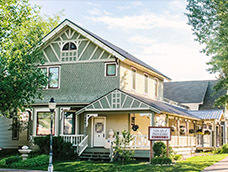 The camps were run by the Army with an average of 34 camps in operation in Colorado each year. Over $63 million was spent operating camps in the state. Enrollees were paid $1 a day, with $25 sent home to their families each month. The money provided relief for families who were desperate for food and basic necessities. 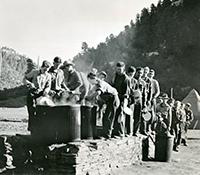 A CCC camp opened outside Steamboat Springs on May 30, 1933. The men came into town on weekends and patronized stores, the movie theater, billiard rooms, saloons, dance halls and churches. Many enrollees met their wives while in camp. The enrollees spent approximately $5,000 a month in nearby communities, helping the local economy during the depths of The Great Depression. Dressed in uniform, Jamerson shares stories about the CCC, reads excerpts from his book, shows a video clip from his PBS film and sings original songs with his guitar. He shares the stories of people both ordinary and extraordinary, with stories of strength, wit and charm. Bill Jamerson's book, Big Shoulders, is a historical novel that follows a year in the life of a 17-year-old youth from Detroit who enlisted in the CCC in 1937. He joins 200 other young men at a work camp in a remote part of Michigan�s Upper Peninsula. It is a coming-of-age story of an angry teenager who faces the rigors of hard work, learning to cope with a difficult sergeant and fending off a bully. Along with a novel and CD of songs, Jamerson produced the film, Camp Forgotten-The CCC in Michigan, which aired on 58 PBS stations. During his talks, Jamerson shares stories about many of the interesting enrollees he has met over the years. A Q&A and book signing follows the program. Attendees are encouraged to bring CCC photos or memorabilia to the program.